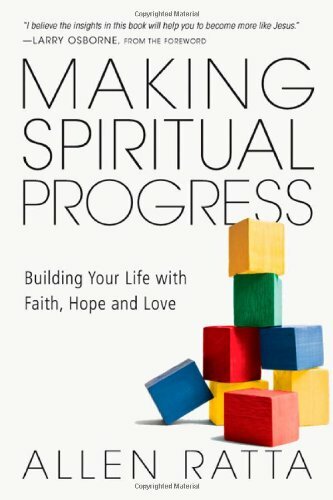 I received Making Spiritual Progress: Building Your Life with Faith, Hope and Love by Allen Ratta from IVP for the purposes of review. It is exciting to read a book authored by a minister from my own denomination (the Assemblies of God), and to read a book that is probably one of the best I’ve seen to truly help people get moving in the proper direction when it comes to spiritual growth and maturity. And I say this as someone who is much more inclined toward Dallas Willard, Thomas Merton, Richard Foster, etc. As a tool to get started, this book can be incredibly helpful. Ratta goes to the heart of motivation. The “why” of doing things needs to come from faith, hope and love. He builds the foundation with the hope that anyone can change. It is the power of the Spirit, but it is also the understanding that our “DNA” changes, not just our behavior. It our behavioral modification discipleship techniques that have caused so many to have stunted growth. Change is possible, but it has to come from the inside out. The author builds from the very foundation and then gives well thought-out processes for how to build on faith, hope and love. He is also clear on the hyper-movements when things get out of alignment. This book is very easy to follow. He does not “bury the lead” as to to “how” to walk in spiritual maturity. I find that refreshing. From the very beginning there is a sense of a journey that is possible and powerful. The appendices are full of Scripture to help root the reader in the truths of faith, hope and love as well. For those are analytical in their thinking, this book is well laid out. For the more contemplative, it comes across as too laid out. But this book has a place in the church for very helpful (and hopeful) discipleship. IVP provided this copy for me to use as a review. I am under no obligation to give it a positive review. Previous postWhat do you treasure?